Supported by the Bender Foundation; The Morris and Gwendolyn Caftitz Foundation; Lieutenant Colonel and Mrs. William K. Konze; and the Sunrise Foundation. Acquired by the Museum in 2006, the Architectural Toy Collection is one of the largest and most sophisticated of its kind held in public trust within the United States. Assembled over the past 30 years by Chicagolander George Wetzel, the collection holds more than 2,300 toys dating from the 1860s to the 1990s. Highlights include building sets that trace the history of such childhood favorites as Lincoln Logs, Erector Sets, Tinker Toys, and LEGO® bricks; rarer and less familiar toys from around the globe; and examples featuring specific buildings or building types, such as skyscrapers and suburban homes. The Architectural Toys collection is in storage and not on view. Please check current exhibitions for a list of what is publicly accessible. George Wetzel discussed the collection in a 2007 issue of Blueprints, excerpted below. 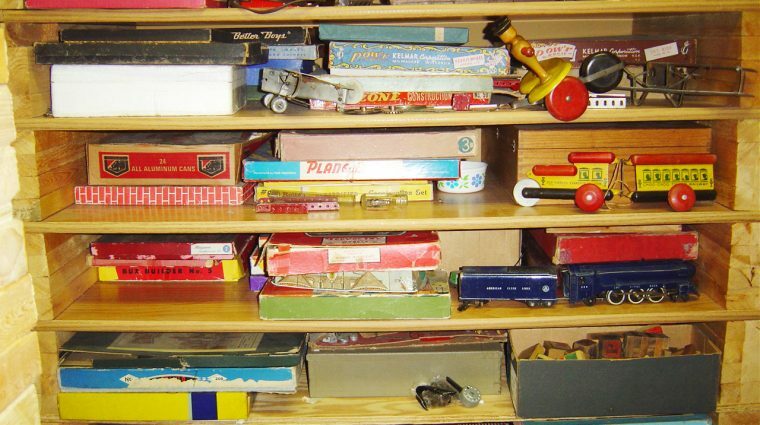 Martin Moeller, National Building Museum: How did your toy collecting get started? George Wetzel: It began about 25 years ago, when I started to have my own family. I was buying toys for my children and soon realized that the ones available at the time were a lot different from the ones I had growing up. Today’s stuff is often a bunch of cheap junk compared to what I remember as a child. There are still sets they call “erector sets” these days, but nothing like what I had 50 years ago. There are exceptions—I continue to buy Legos, which I enjoy. They are among the few toys that I still think well of. Legos have always been good in terms of function—they challenge kids’ creativity. Within a year or so after I started buying toys for my kids, my own dad actually turned up my old American Flyer train, and within another year my mother turned up my old Erector Set. They were so well made back then, you just didn’t throw them away. You kept them for the next generation. When I started collecting, I found that this was not unusual—handing down from generation to generation. But my kids did not show much interest in toy trains. 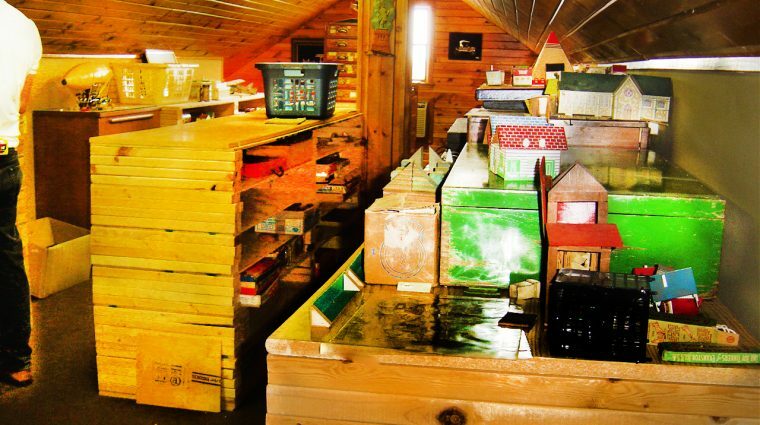 Shelving for architectural toys in George Wetzel’s attic. Gradually, I found a lot of other Baby Boomers like me, and then I realized that there was a group of collectors of toy trains. The more I found the more I rediscovered the history and variety of these things. I got the collecting bug. Gradually as my kids showed less and less interest, it turned into an addiction for me! Moeller: But you did not have a background in architecture or engineering, right? Wetzel: I am a retired English teacher. I took a few classes in college about architecture, but that’s not really what drew me to this. A lot of collectors of these toys are architects and engineers, but not me. I decided to keep my collecting interest fairly broad. I asked myself, “What has not been done before? What is really unique?” So I came across architectural sets fairly early on. Moeller: How did your philosophy of collecting develop? Wetzel: It was a learning process—every year I came across some new toy and new piece of history. I wanted to have a representative collection of just about every type of building toy that was made. I started writing letters to people, joining collectors’ groups and clubs, and found out where you can get these things. Most of the items initially came from other collectors. I went to trading shows, where you could buy, sell, and trade. I kept bumping into the right people. Once they realized I was a serious and studious collector, they let me into the “club.” I didn’t have a lot of money—I soon found it was kind of a rich man’s game—but I made a commitment to acquire things over a long period of time. I always made a point when I met collectors to go see their stuff first hand. Once I saw those collections, that is what pointed me in a direction that no one else had quite gone. I focused on the architectural aspect of these toys, which I didn’t see anyone else doing at the time. Moeller: Did your attitudes toward the collection itself change over the years? Wetzel: My objectives changed. I have been doing this about 25 years, and about every five years my direction changed a little. There was a certain point in time I remember when I decided that, on the one hand, I could devote myself to actually building layouts from these sets and spend hours away from my family. On the other hand, I could just collect and put them on a shelf and enjoy them—and keep spending time with my family. I just enjoyed the collecting aspect more than the actual building. As I got into it, once I started seeing some of the exotic and unusual Victorian pictures on the box lids, that intrigued me even more, especially the old period graphics on the boxes—boys in knickers and girls in pinafores. Moeller: Forgive the cliché question, but what are your favorite items in the collection? Wetzel: I could probably find a dozen really unusual, rare, and valuable items. There’s the Bilt-E-Z, a metal set made in Chicago in the 1920s, which can be used to make a very realistic looking early skyscraper. Not only was the result authentic, but the set fit together easily—it was easy to use. Some others are so awkward and hard to build with—really not for kids at all. Examples of the Bilt-E-Z set can be found, but to find a large set that’s whole and presentable was tough. Moeller: You have pointed out that one of the ironies of collecting is that people tend to collect unsuccessful products, because they were not produced in large numbers and are therefore rare. So what are the worst items you collected? One of the oddest is the Build-a-Set, though there are lots with similar names. It was made in the early ’40s. During the war, there was a metal shortage, so this was made out of cardboard. Instead of nuts and bolts, there were little wooden pins. It’s so flimsy—the whole concept was crazy. I found two versions—one in mint condition, the other mangled, showing what happened if you actually tried to use it. Moeller: You primarily collected sets that were used to create miniature buildings. Where does the history of such sets begin? Wetzel: A lot of early sets had religious connotations. They were often used to build model churches. It was traditional to play with them on Sundays, but then the kids would have to put them back in the box and not play with them again until the next Sunday. Some pieces had scripture verses written right on them. So they were attempting to instill Christian values with these blocks in a hands-on, tactile way. That’s where this all started back in the 1850s. Moeller: How did they develop from there? Wetzel: From there through the 1890s they became more sophisticated. A key figure was Frederick Richter in Germany in the 1880s. He made building blocks that were like stone. By the 1890s, they started putting metal pieces in the sets for roofs and floorboards, or to make bridges. Before the introduction of metal parts, roofs, in particular, were always a problem, so this was a step to another level of realism. In 1901, Frank Hornby invented the Meccano set in England—a precursor to the Erector Set in the United States in 1913. This brought building sets to a whole other level, with wheels and other moving parts. A.C. Gilbert, who invented the Erector Set in 1913, was a genius at several levels. Once he got into toys, he made refinements to what Hornby had done, operating on the theory that bigger is better. With Gilbert’s set, you could make bridges and towers seven or eight feet high, as well as airplanes and zeppelins and locomotives. He really brought it out of toy realm and into the model-building arena. The high-end toys from the teens, ’20s and ’30s are highly sought after. Then came the Depression and the war, and Lincoln Logs and Tinker Toys became popular because no one could afford to make metal toys. Then in the ’50s and ’60s, it was all about plastic. I kind of feel lucky to have grown up in the ’50s, because I was part of the last generation to have a lot of really high-quality toys. Moeller: When did you decide that it was time for the collection to find a new home in a museum? Wetzel: Eventually, after about 15 years of collecting, I could barely walk into my attic, and that’s when I realized these things belong in a museum. That’s also when I started writing stories about my experiences as a collector. Not much happened for some time. But then I spoke to Chase [Rynd] a couple of years ago. He came out and looked at the collection, and he was thoroughly taken by it. I was very pleased, as [the National Building Museum] is exactly the type of place where I hoped it would end up. Moeller: How would you assess the importance of this collection for posterity? Wetzel: When you see people pick up these items and touch them like they are their old friends, you realize the connection. These were so popular then— they were the equivalent of the video games of today. And yet, in many ways, they were the exact opposite of the video games. These toys demanded a lot of patience, a lot of creativity. You’d spend a whole evening with these things—hours and hours. The whole family could enjoy them. Now [that the collection has gone to the National Building Museum], future generations will have a chance to catch a glimpse of another way of life.